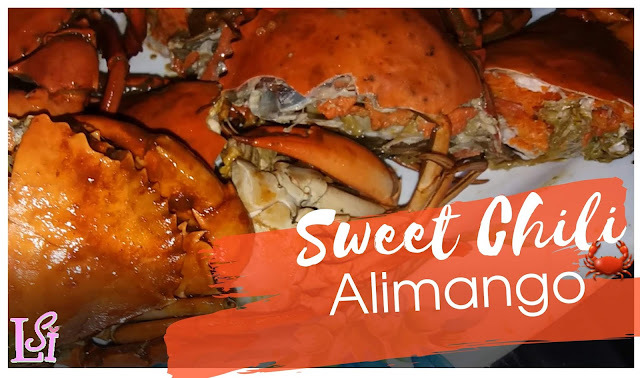 How to cook Sweet Chili Alimango (Crab) ~ Live. Share. Inspire. It is a Sunday and a happy day with family and friends. Let me share with you how we prepare a mouth-watering Sweet Chili Alimango dish. This dish can serve up 8-10 persons. A day before, place the crabs and container in a freezer. Why freeze them? This process will kill the crabs with pinchers intact. This will prevent the pinchers from falling off their bodies when they struggle during cooking (if you cook them alive). Ofcourse, this will save your fingers from getting pinched! Place the Crabs in a large pan to boil under medium fire for 15-20 mins. Place enough salt to bring additional taste. We call this process as 'lusgos' No need for seasonings at this point because we will also prepare its sweet chili sauce. Remove the crabs using tongs and set them out to cool. First, Sauté onions and garlic together for 1-2 mins. Then, mix ginger and chili for 2-3 mins until the ginger is cooked (reddish look). Sprinkle with magic sarap. Mix the crabs and spices then leave 3-4 mins. Flip their sides too to mix well. Pour tomato sauce and mix well in one section before mixing all the crabs. Leave to simmer for 3-5 mins. That's it! It is always an enjoyable experience to cook for our family and friends. Thanks to Bryan for taking the lead. Busog much. Live. Share. Inspire. 'Til next cooking session! Looks like a really tasty recipe. That looks so good and I don't even eat seafood, my family does so I will definitely try to make it for them. YUM!!! I love cooking new things so I cannot wait to try this! Wow this looks interesting!I love crab. Wow, I've never cooked crab before but this looks yummy! Love to try out this recipe when I go buy crabs at the seafood market. All we ever do is boil it and eat it with pepper and lemon. Need something new and these look delicious! I love seafoods but alimago is not much my favorite coz its tedious to prepare and to eat. Shrimps are better!